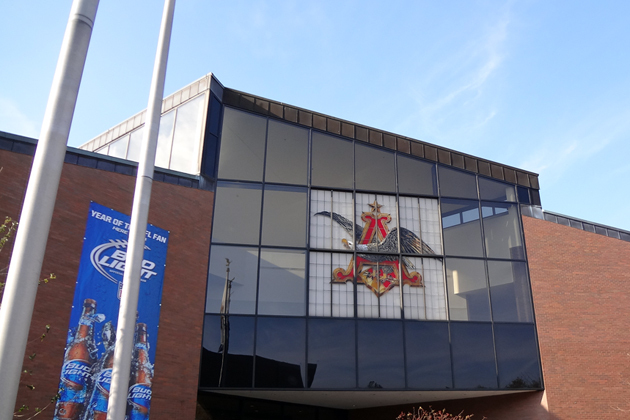 On day two of the Kingford Invitational trip I enjoyed a great hearty room service breakfast (and I'm not usually a breakfast eater), then it was down to the lobby to get on the bus for the day's festivities, which began with a tour of the Anheuser-Busch brewery. Nine o'clock seemed a little early for beer, but I was looking forward to the tour, as most dudes love to see how things are made. 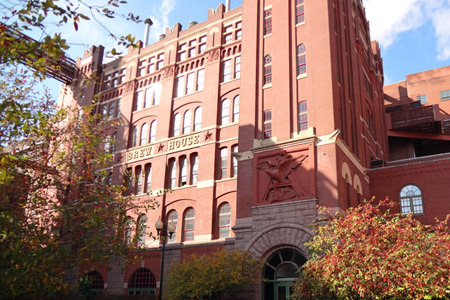 After a short ride, we arrived at the brewery and I was immediately struck by that familiar yeasty beer smell in the air. It was like the brewery equivalent of the outdoor aroma from a bakery. It left no doubt as to what was happening there. 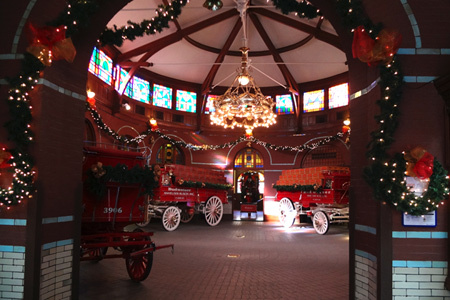 Here's the area where the tour begins. 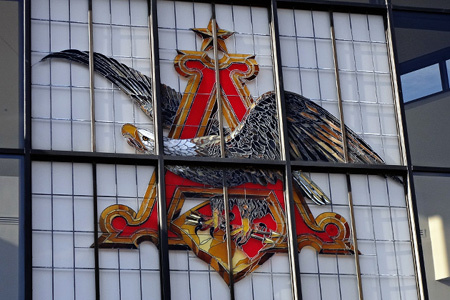 It's chock full of all manner of Anheuser-Busch memorabilia. 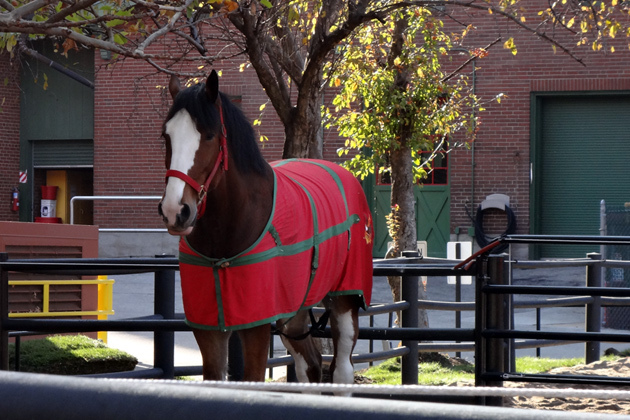 After a short introduction about the history of the company, we set out for our first tour stop -- the famous Clydesdales. We've all seen them on television and in print, but nothing can really prepare you for seeing them in person. To qualify for one of the traveling hitches, a Budweiser Clydesdale must be a gelding at least four years of age, stand 72 inches at the shoulder when fully mature, weigh between 1,800 and 2,300 pounds, have a bay coat, four white legs, a white blaze, and a black mane and tail. 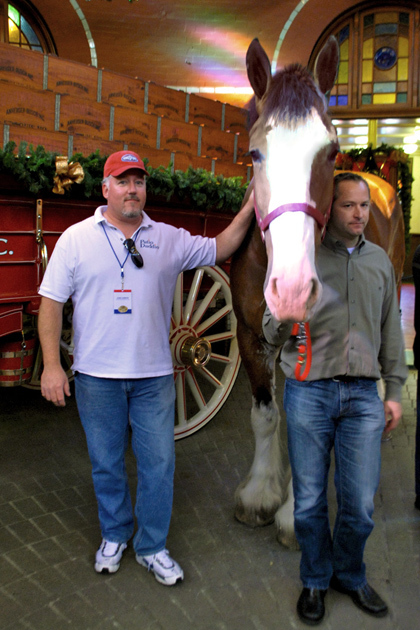 For comparison purposes, here I am standing next to their largest horse. I'm 6'4", and he's 19.5 hands tall. Also, check the feet. I wear a size 13, and each of dude's shoes are 20 inches from end-to-end and weigh about 5 pounds. 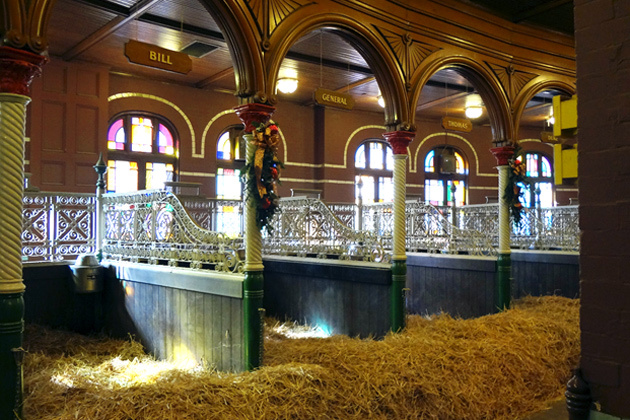 Here's a wide shot of the horse paddock that had already been decorated for Christmas. The shot above was taken in the center. Free photography tip: Never shoot in a room ringed in stained glass on a sunny day. Most cameras don't have a "filter out the random blasts of Star Trek tractor beam-like colored light" setting. These gentle giants have some seriously nice stables. Their names are really simple, like Duke, General, Bill, Annie, etc. Wait... Annie? I thought that they all had to be geldings. Oh well, it must be a PC thing. Next we headed into the various parts of the brewery, which covers 119 acres on the original site. You can feel the history in the charming old-world architecture. These pictures really can't do justice to the enormity of the brewery operation. Here are a couple of the brew kettles. 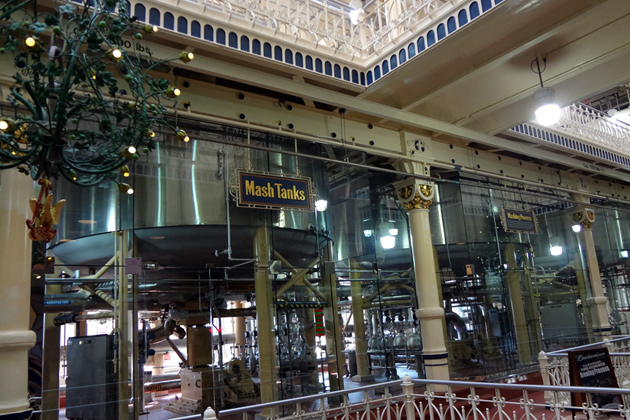 Here are just a few of the mash tanks. 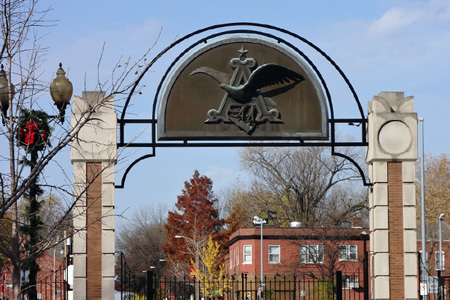 These are on the second or third story of the monstrous brew house building, I can't remember. 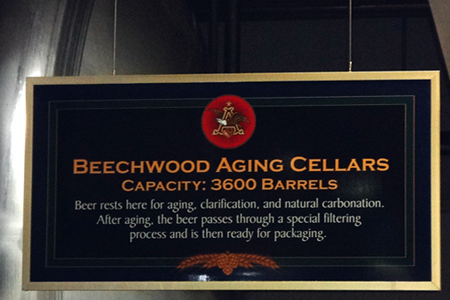 The last step of the brewing process is Anheuser-Busch's unique beechwood aging. 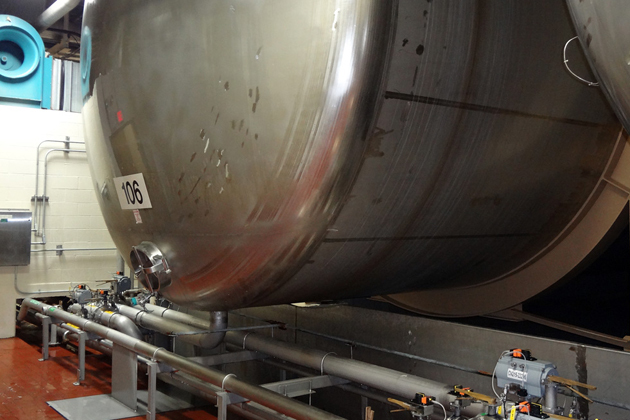 The beer is stored in these massive tanks that have curls of beechwood in them to draw out and collect the particulate yeast. That's what helps make Bud so crystal clear and crisp. This also naturally carbonates the beer. To give you an idea of how big these tanks are, our tour guide said that each one contains 250,000 six packs. To put it another way, you'd have to drink a case of beer per day for 137 years to drain one. 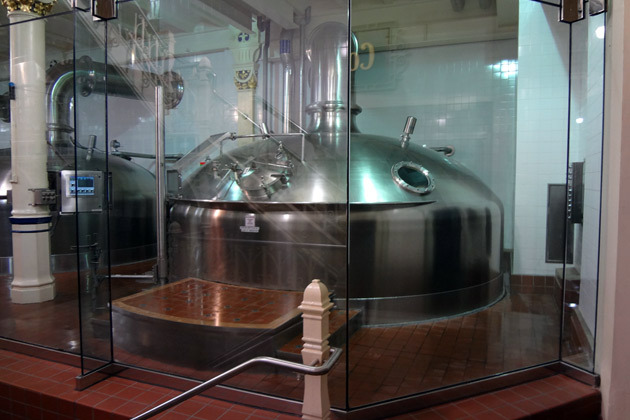 Oh, and there are 150 of these tanks just at this site alone. Let your brain do some mathematical fermentation on that for a minute. 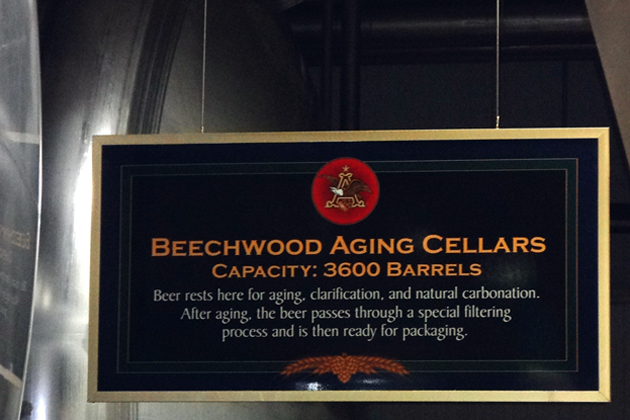 The beechwood is raked out of the tanks, cleaned, sanitized and reused as many as six or seven times. 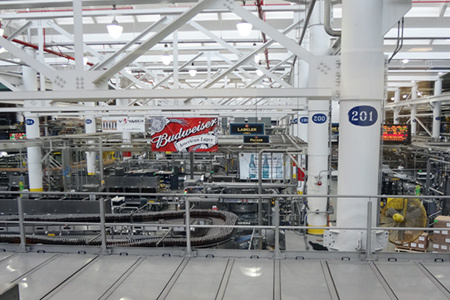 Next, the beer is on to the packaging lines. Again, these pictures cannot begin to capture the enormity of this operation. The line is like a river of bottles (lower right) that sing as they gently mingle and flow. It truly is mind boggling. After the tour we went to their hospitality room for a four-course lunch with beer pairings. I'll admit that I'd never thought of beer like most do of wine, but it worked. We started with a salad and Shock Top vinaigrette. 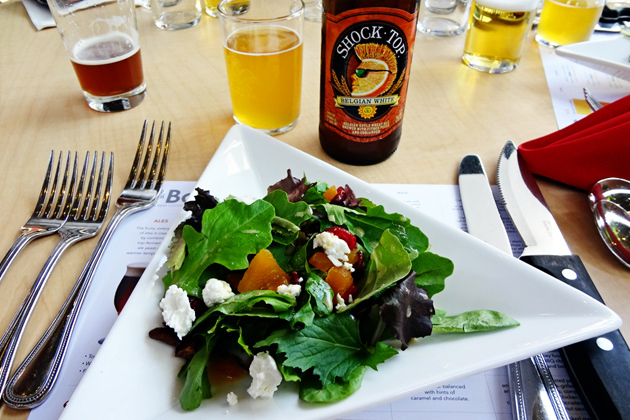 The orange and cranberry in the salad really paired well with the beer. 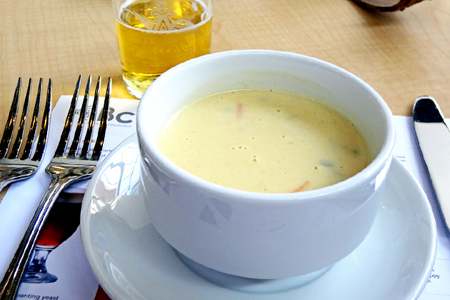 The next course was an outstanding cheese and jalapeno soup made with Budweiser. To me this was the second best pairing. They served it with Budweiser, obviously, and it really was a perfect combination that I didn't expect. Who knew that Bud and jalapenos were a match made for each other? Trust me, they are. The chef said that this soup is a regular favorite in the brewery cafe, and I understand why. The main course was a beer-marinated flank steak with a shiitake mushroom and green onion yakitori skewer. With this course the pairing was Stella Artois. 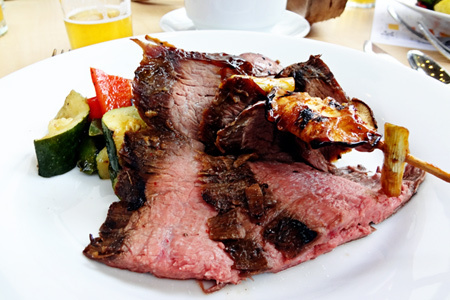 The steak was cooked perfectly, and the combination of flavors worked well. You can't go wrong with a grilled steak, mushrooms and onions. 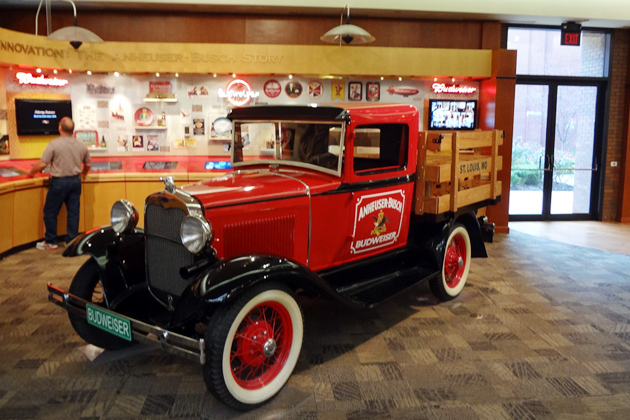 We took staves from fresh bourbon barrels and we aged the beer on those staves and spiced it with a hint of vanilla,” said [Daniel] Westmoreland, who has been a Budweiser brewmaster for more than 30 years. “It’s an all-malt brew, and it has a perfect color that is similar to the color of bourbon itself. Batch No. 23185 has a nice vanilla aroma with a little oakiness on the end – it’s a great beer. 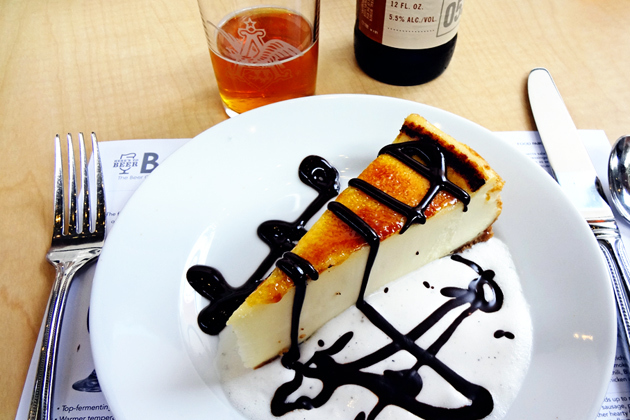 If someone would have told me that I'd dig beer, any beer, with cheesecake I would have told them that they'd been smoking too much vanilla. I can't describe why it worked, but it really did. The Project 12 sampler packs are still available, but when they're gone, they're gone. 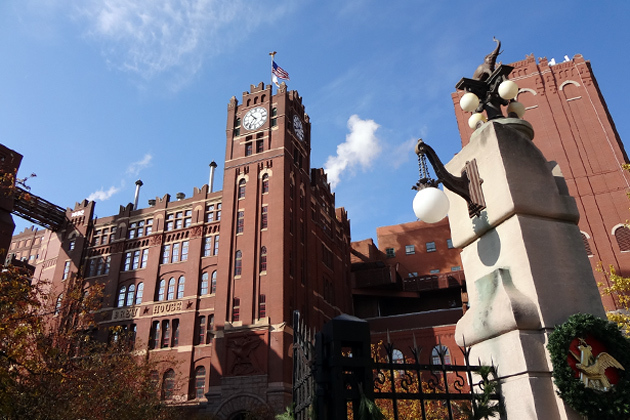 I really enjoyed the brewery tour and lunch. It was great to see a true slice of Americana. Thanks to you, Mr. I Brew Bud For A Living Guy! After lunch we all piled back into the bus and headed Southwest to Belle for the Kingsford Invitational. MMMMMMM! Makes me hungry all over again! What a day! I'm glad I got to meet you and enjoy these pairings with you! Great post, John. My favorites in order were steak, cheesecake and beer cheese. Thanks, Chris. It was great to hang out with you again. Thanks also for the picture. John - I really enjoyed meeting and bantering with you. I hope we have an opportunity to hang out again.